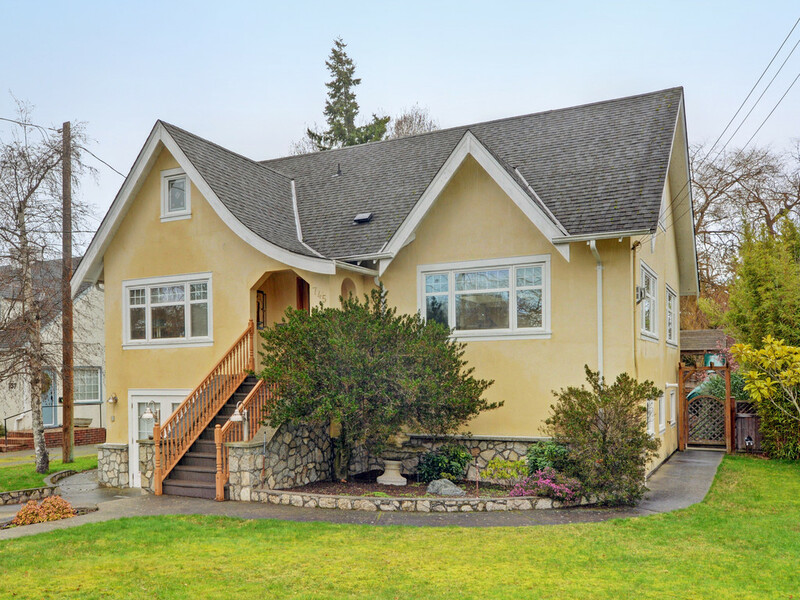 Built in 1930 and extensively renovated in 2003, this Oak Bay home is a character-filled masterpiece with all the modern luxuries. From the street this home is the picture of a quaint, country cottage. Inside, it is a spacious, modern home with real charm. Featuring five bedrooms and three bathrooms, this family home is spread across three levels. The entire upper floor is dedicated to the luxurious, private master retreat. The huge master bedroom features pitched ceilings and exposed timber beams, and boasts an abundance of storage space, with built-in closets lining two walls. The ensuite covers half of the upper level, with period dual vanities, separate powder room and shower, and a deep-soaking tub nestled within a cosy nook. Entry to the home is via the middle level. This floor is where the household comes to life. Bright and open, the living room, dining room and kitchen flow into one another, creating a grand space with eight foot ceilings. Overhead skylights fill the kitchen with natural light. This space will be the gourmet cook's delight, boasting quartz counters, maple panels, gast range and an abundance of counter and storage, as well an island sink and breakfast bar. Two bedrooms - or one bedroom and an office - and a bathroom complete the main level floor plan. Downstairs three more bedrooms are lined neatly in a row. There is another bathroom, laundry and large exercise room, garage and storage. The rear yard is a maintenance-free zone, with plenty of space for children to play. Located in South Oak Bay on St. Patrick Street, it's just steps to the local cafe 'de'lish', parks, McNeill Bay and golf, public transport, and close to private and public schools and the Village.